Henrik Ibsen wrote an epic play in five acts that has often scared audiences and artists away while others affectionately embraced it. So when someone tries to tackle Peer Gynt, there's a bit of fanfare for us Peer Gynt aficionados. 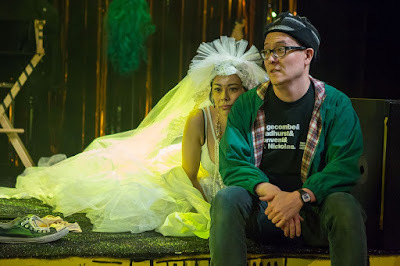 Ma-Yi Theater Company brings an ambitiously rockin' adaptation of the Ibsen classic in Peer Gynt and the Norwegian Hapa Band where the titular character rocks and roll through the world without consequence or care. Set to a rock and more score, Michi Barall's adaptation, with music by Paule Lieber and Matt Park, is daring but quite scattered. The overall vision that director Jack Tamburri infused was reminiscent of an 80s rock and roll party band bringing the story to life. It’s reflected in the scenic design by Meredith Reis with that tinsel curtains and string lights. But then things get a little weird with the Norwegian hieroglyphics on the base and the floor. While interesting, it didn’t seem to live in the same world. And that is a reflection of Tamburri’s staging. The scenes went all over the place. The usage of microphone lacked consistency. Sure, with an array of characters to portray, Tamburri didn’t give his company much fluidity and definition in the various worlds. Asta Hostetter’s costume design matched the loud world Barall, Lieber, and Park devised. But with so much going on throughout the production, excessive patterns were merely a distraction. Any Peer Gynt will live or die through the actor portraying its titular character. He is the reason we watch the journey. Matt Park didn’t quite take command as Peer. He allowed the world to control him. Peer is an easy person to dislike and Park ran with it, providing no depth in his arc. Park was picked up by his supporting cast, namely Angel Desai, who frequented Peer’s women, Mia Katigbak, playing Peer’s mom, and Titus Tompkins, who banged on the drums while portraying Peer’s rival. Desai had a innate skill to portray the women scorned. She eased into the sultriness of the characters, tempting him throughout. Park was strongest in his scenes with Katigbak’s Ose as they were the most natural and Ibsen-like. Their dynamic was pure and fun. Tompkins stole the show with his vast character skills as well as his boisterous skill on the drums and mandolin. Ambition took center stage at Peer Gynt and the Norwegian Hapa Band. In the note from the creative team, they seem ashamed that they slimmed the playing time and yet it still felt excessive. I can guarantee this story can be perfectly told in ninety minutes. Perhaps with proper trimming and cohesion in the book and score, Peer Gynt and the Norwegian Hapa Band could be something cool.